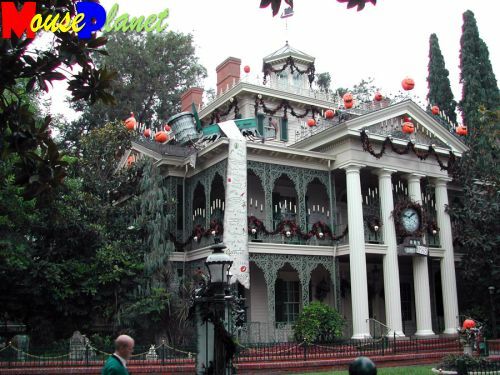 The Haunted Mansion Holiday overlay continues to be a popular feature at Disneyland, and the fourth season in a row provides an apt segue into the holiday season. Join me for a look at the holiday decorations for this popular attraction, with my photos from 2002, 2003, and 2004. 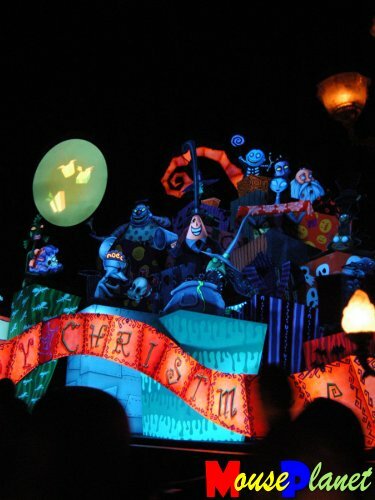 Jack Skellington sits atop a big jack o' lantern to beckon park visitors into the Haunted Mansion Holiday in this 2003 photo. 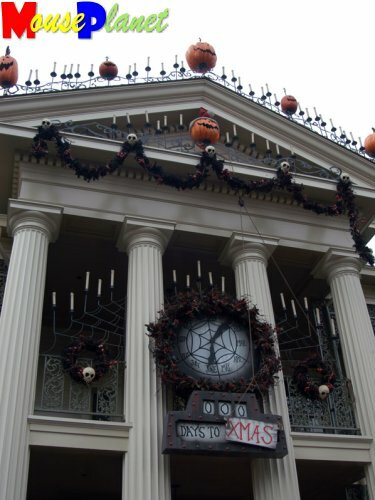 All upstairs railings are decorated with candles, and the spooky skull wreaths hang along the awnings in this 2003 photo. 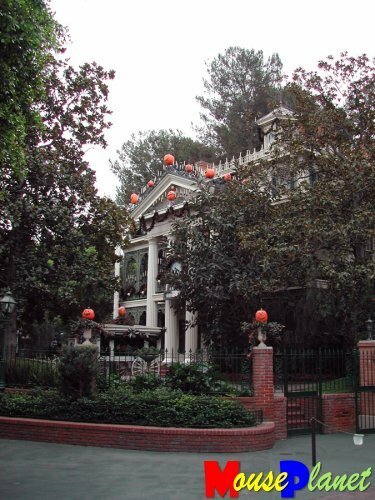 Even the overcast skies cooperate to add a sense of gloomy foreboding at the Haunted Mansion, with the only colors being the multiple jack o'lanterns placed atop the mansion. Do note, however, that one of them is wearing a Santa hat in this 2003 overlay. The countdown clock looms over the front of the mansion. The candleholders, made of black wrought iron, look like a spider web in this 2002 photo. 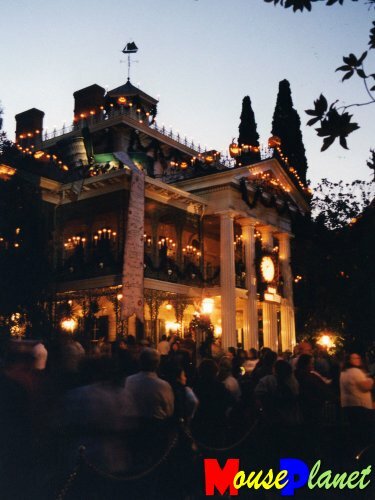 The Haunted Mansion Holiday takes on a wholly different look at night, when the mansion is lit up with the orange glow of candlelight. 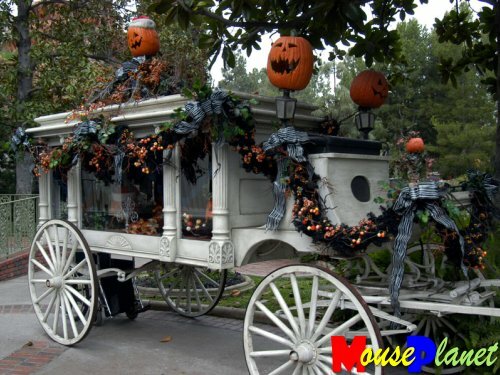 The horseless carriage hearse looks particularly festive this time of year. 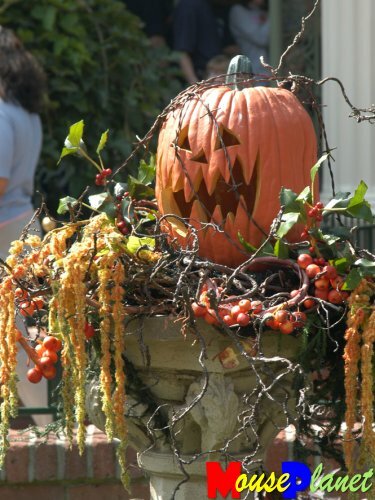 Barbed wire strewn across the jack o'lantern ensures that no park guests accidentally try to decide to take the decoration home in this 2004 photo. 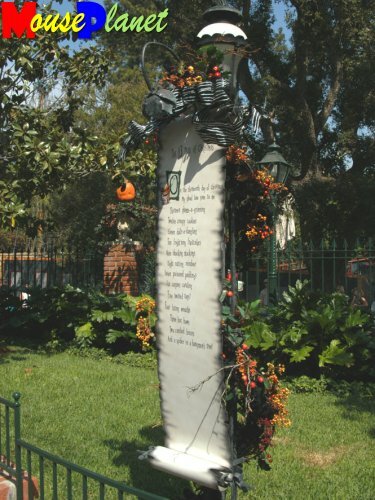 The lamp posts along the Haunted Mansion Holiday queue are decorated with lyrics for various scarolsholiday tunessuch as The 13 Days of Christmas, which celebrates the various gifts a ghoul love gives. 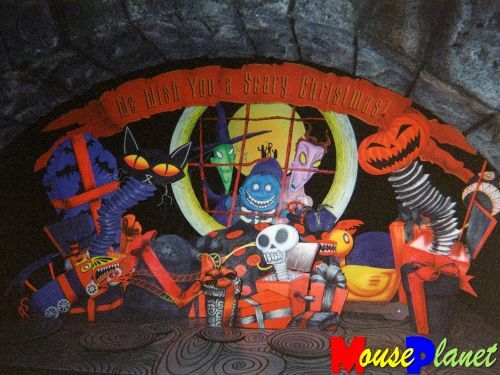 The ride loading area in Haunted Mansion Holiday provides a first full look at the many cast of characters from Nightmare Before Christmas. 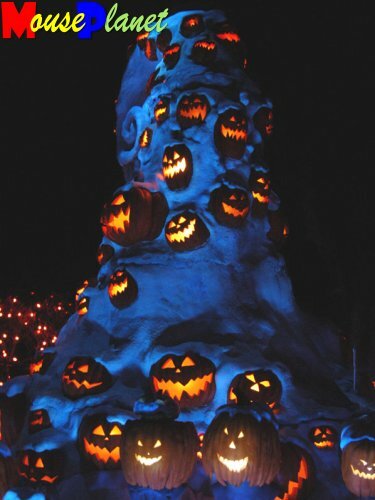 One of the largest effects in the interior of Haunted Mansion Holiday, this hill of jack o'lanterns appears as the first item you see in the Graveyard Scene (the last room in the ride). 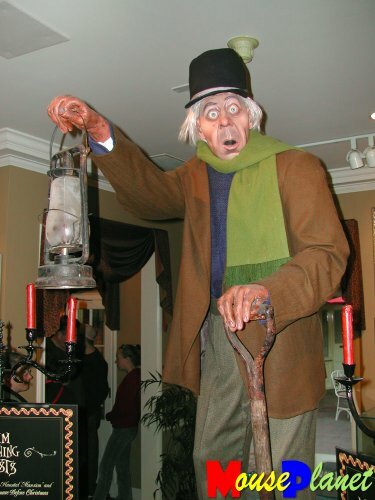 The cemetery caretaker, normally stationed at the bottom of the hill at the start of the Graveyard Scene, was one of the featured items during a special Haunted Mansion exhibit in the Disney Gallery in 2003. 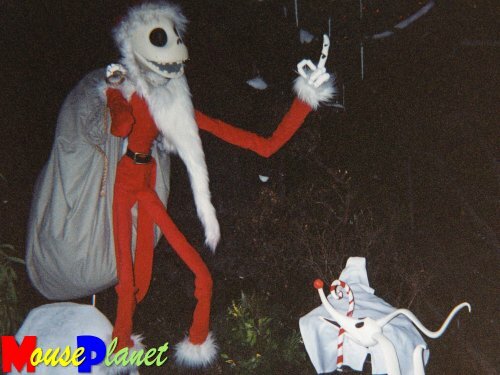 In the place of the caretaker, the location is taken over by Jack Skellington (dressed as Sandy Claws), and his ghost dog, Zero. 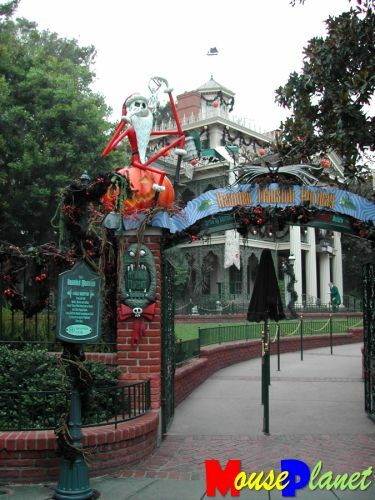 The area after the Graveyard Scenewhere the three hitchhiking ghosts normally try to follow you homeis converted every year so that someone from Nightmare Before Christmas can bid you farewell. In 2002, they were Lock, Shock, and Barrel from the movie (and lots of lively gifts).